I liked this book because it shows how much most of us (including myself) take the little things in life for granted, because who knows what will happen tomorrow? Samantha Kingston is one of those girls. You know, the girl everyone envies, the girl who has the “perfect life”. The one who does the teasing, not the one getting teased. She has a group of best friends and the most popular guy at Thomas Jefferson High as her boyfriend. On February 12th, for Sam it’s just another day, but instead it turns out to be her last. Taking her charmed life for granted until it’s pulled out from under her. Sam may be the girl everyone wants to be, but is that charmed life really worth having to lose everything before you can realize that? Getting a total of seven chances to live her last day over again, will Sam learn to appreciate the little things in life? Will Sam find out who she really cares about? Or will she try and cheat destiny, just to live again? 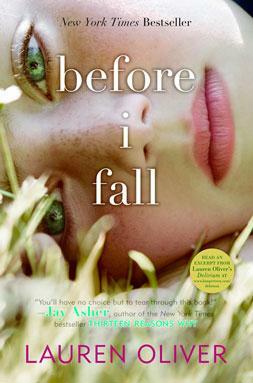 Find out in “Before I Fall"!